This long-running Popular Publications crime pulp didn’t have the big assortment of recurring characters such as those found in the company’s Black Mask and Dime Detective, but it published a good deal of excellent fiction in the Forties. He sold one short story to a pulp in 1936 and spent ten years (with World War II service intervening) trying to sell another. 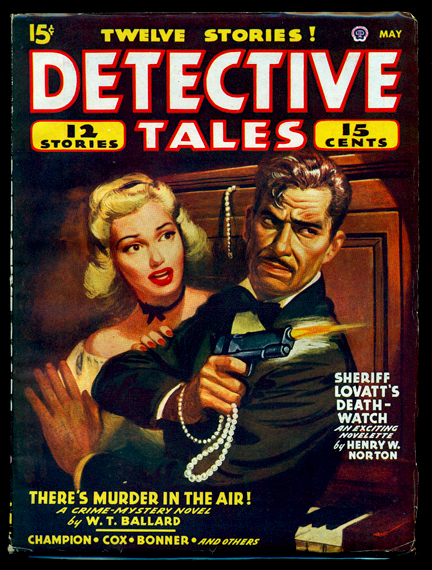 This issue’s “Cash on the Coffin” was his first published pulp story after leaving the military and, as such, can rightfully be considered the beginning of his long career. Other top-notchers with stories in this issue include D. L. Champion, W. T. Ballard, and William R. Cox. Condition: Very Fine, uncirculated publisher’s file copy. The text block is lightly yellowed, but otherwise this magazine looks exactly as it would have on a newsstand in 1946. A gorgeous sample for condition-conscious collectors.